I’ve partnered with my friends at ThermoWorks to giveaway their Smoke 2-Channel Alarm Thermometer. Designed for competition BBQ teams and professional chefs, Smoke outlasts and outperforms every competitor. Not a cheaply-made housewares product, Smoke features a rugged housing with molded-in seals for splashproof protection. 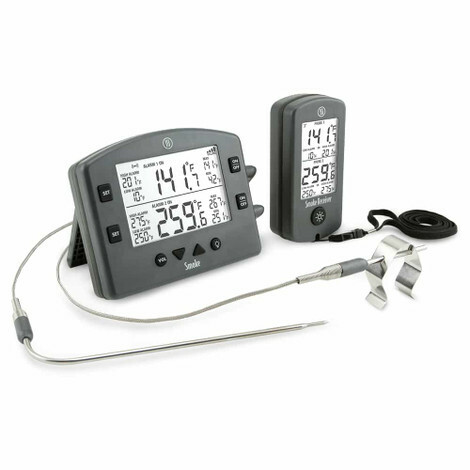 Smoke uses Pro-Series Probes which are interchangeable with Smoke, ChefAlarm®, and DOT®. Eligibility: United States only. Last Day to enter for this Giveaway: April 21, 2018 11:59 pm PST. Winner will be randomly selected and contacted via email on April 22, 2018. Giveaways are open to registrants 18 years or older with a U.S. shipping addresses only. For Slap Yo’ Daddy BBQ ‘s international friends, you may enter and if you win, we will be more than happy to send the prize to a person of your choice with U.S. shipping address. No purchase necessary to enter or win. If your entry is successfully submitted, you will be redirected to the “Thank You” page. Hope to win, never won thanks for giveaway. Hope to win!! Hubby desperately needs to get his grilling game back! Any news on upcoming Giveaways? Hey Ed, I’m discontinuing this page in 2019 as I’ve shifted my focus on YouTube videos to reach a wider audience. You’ll see my sponsors products in use my me in my videos instead.